Are you looking for local products? A place that features local ingredients, Vermont Meats, and area brewed specialties? Then the Ciderhouse restaurant in Newport is for you. Located in the Northeast Kingdom Tasting Center, this Newport Restaurant is all about eating local. Their menu is varied, and emphasizes simple food done well. The atmosphere is unique – an industrial space, tempered by beautiful flowers just outside the window, an eclectic mix of furniture, and decorated chalkboards on the walls. The menu is where this restaurant shines. Being a part of the tasting center, there are so many regional items to choose from. Starting with the bar – Hill Farmstead, beers from all over the state, and Eden Sparkling Cider are all available – the perfect start to an all local meal. They also carry Eden Iced Cider – so be sure to try one after your meal. 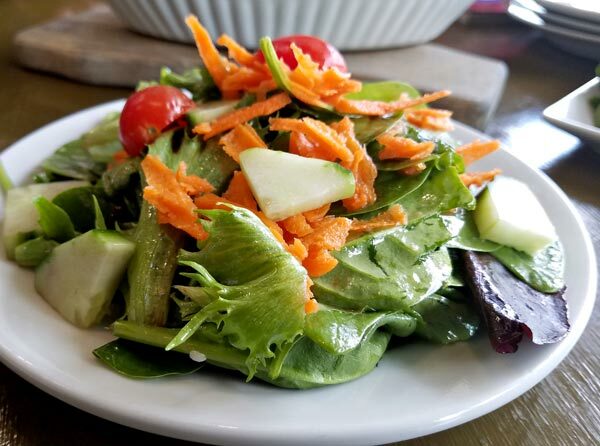 A cheese plate featuring local cheeses and staring Bailey Hazen Blue, or salads with very fresh, local produce are huge highlights on the menu so don’t miss out on these. 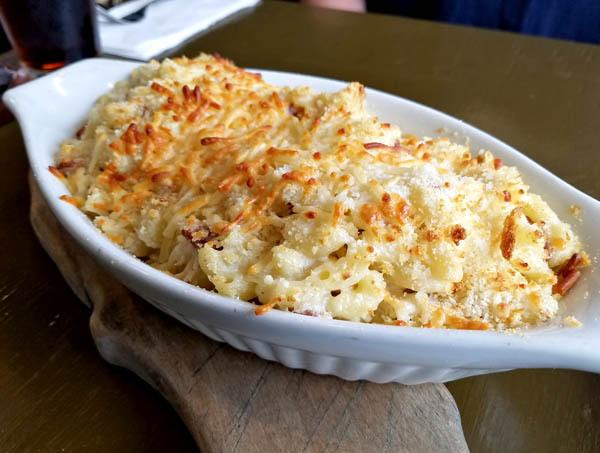 The restaurant features many “simple” dishes, like mac and cheeses, pulled pork, burgers, and sandwiches – but all of these items are prepared to make the ingredients shine. In fact, the mac and cheese here may be the best restaurant mac and cheese I have eaten in all of the NEK. My favorite way to order it is with pulled pork. The bubbly cheese sauce mixed with their barbecue sauce is not to be missed! This is not a dry mac and cheese, and the portion size is huge (this is always two meals for me). I have tried a number of other menu items here. 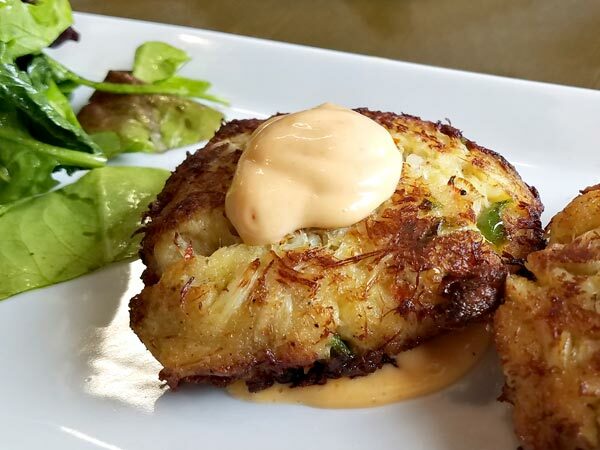 The crab cakes are another favorite of mine. Large chunks of crab are immediately apparent when you break into these cakes. And they are not covered in breading, so the light flavor profile of the seafood isn’t buried. Served with a spicy aioli sauce, this app has a nice bite, and is a great way to start your meal. The burgers are a favorite in the area. We recently tried the Green Mountain Burger. 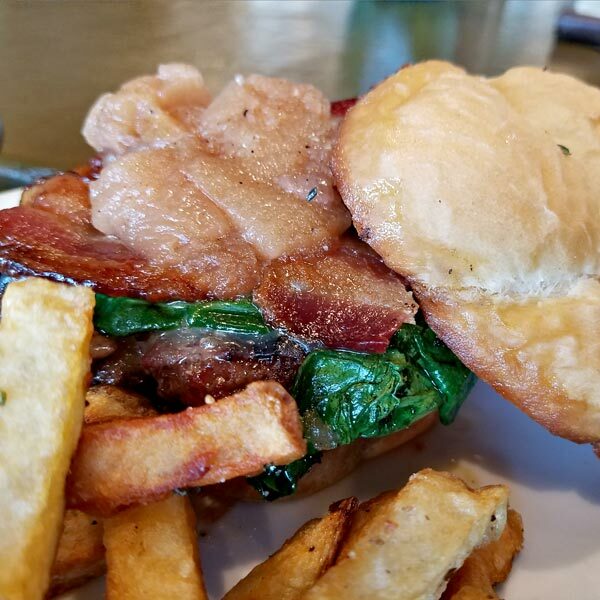 A take on an NEK Pizza staple – this burger includes fresh apple slices, spinach, local bacon, and is drizzled with maple syrup. The combination provides a very fresh flavor profile. The burger was cooked perfectly (we ordered ours medium), and well seasoned. I will say I could have used more maple but that is a personal preference. The only down side to this burger is that the bun doesn’t hold up well to the water content of the ingredients, but it isn’t a real burger if it isn’t messy – right? The extensive app menu, and the large portions make this a great place to swing in for an afternoon snack. And because it is located right on Main Street, it is close to many offices and shopping so swing in for lunch the next time you’re in town. If you’re really into the local aspect, check the back of the menu for a list of area and state farms where ingredients are sourced. Walking into the Northeast Kingdom Tasting Center can be a little confusing. It is a large open warehouse location where a number of individual businesses rent space – all food related. The Ciderhouse is one of these businesses. The warehouse nature of the space combined with the decor – including white paint, modern lighting, and metal accents – gives an industrial feel to the entire space. The Ciderhouse space is made more comfortable by adding wood tones, eclectic furniture like school desk chairs, old farm table chairs, benches, and wooden tables of differing sizes and styles. The overall look is very charming. Unfortunately, many of the seating options are difficult to sit in for long periods of time – I suggest snagging a bar seat, or a table with a bench. The biggest problem at this Newport restaurant is the noise. Being that the space is open, and the kitchen is mostly an open kitchen, the sound echos. The owners have tried to minimize this noise through the placement of furniture between the kitchen and dining area, but the height of the ceilings makes quieting that sound difficult. If the kitchen is busy and there is a large crowd in the restaurant, it can be hard to hear the people sitting across from you. Even with that drawback, the Ciderhouse is a restaurant you should experience. We love to take visiting guests there to get a good sense of regional food, and an enjoyable meal. I try to pick times where it won’t be so busy, and I often choose to get a few items from the other businesses in the Tasting Center making for a great eating experience.